MIDIbox 808 is a variant of MIDIbox SEQ V3 and is mainly intended as drum sequencer for Jeff Farr's MB808 project. 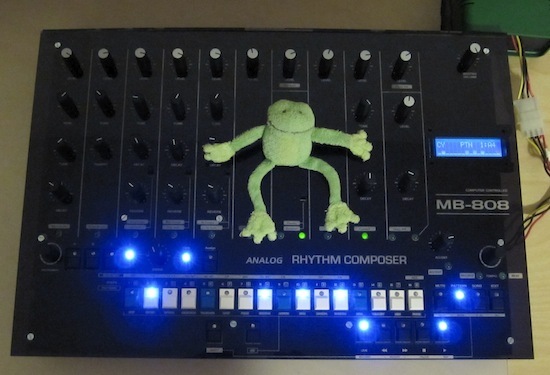 But it is possible to use the firmware for other "analog drums" projects as well, or as MIDI drum sequencer. Minimal (=inexpensive) control surface with 33 buttons, 35 LEDs and 1 rotary encoder. Additional control elements (e.g. 4x16 Button/Duo-LED matrix, Instrument selection encoder, BPM LED digit display, 2x16 LCD or two 2x40 LCD, etc...) are supported as well, but they are not required to experience the full potential of the firmware! A pattern is divided into 4 sections (A/B/C/D), which can be used for variations. One track can be optionally used as global accent (requirement for MB808 drums). Note that this accent layer has it's own time base and step progression!!! Live recording function allows to record all 16 instruments in one run, controlled from the GP buttons, or from an external MIDI device (drum pads or MIDI keyboard). The MIDI solution has the advantage, that the auxiliary trigger layer (e.g. accent or flam) can be controlled with the velocity of MIDI Note events. Sequencer can be perfectly synched to MIDIbox SEQ V3 or similar sequencer/groove boxes/recording software, either as MIDI clock master or slave. A DIN synch output for clocking vintage gear (e.g. original TR-808, TR-909, TB-303, etc...) is provided as well. A DIN synch input is not provided! 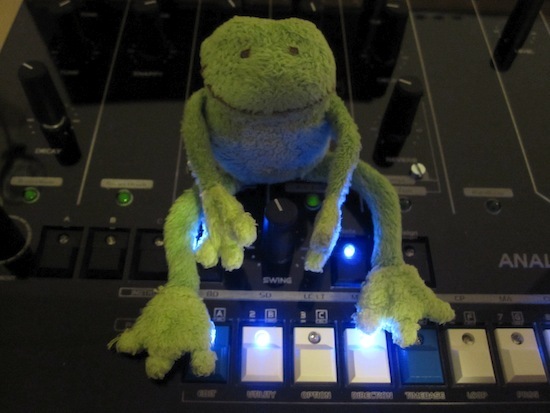 It is possible to run the firmware on the original MIDIbox SEQ V3 hardware, but not all control elements will be used. The 16 GP rotary encoders are used to select the instrument (they don't change values), the two 2x40 LCD will be enabled to show the correlating button functions, but the messages won't be so selfexplaining like known from MBSEQ (many abbreviations...) to allow easy re-use between 2x40 and 2x80 output functions. In other words: the option to install MIDIbox 808 firmware on MIDIbox SEQ V3 is provided for people who want to evaluate this alternative solution, or just want to spend some nice hours with a dedicated drum sequencer. BankSticks won't be re-formatted while switching the firmware - but because of the changed data structure, patterns will output "random data" when played with a different firmware! An "Instrument selection" encoder as alternative possibility to select a single track, or all tracks together. A "swing" pot, which controls the "groove intensity" with a higher resolution (in groove layer, only 3bit = 8 values selectable). This pot is already part of MB808 PCB. or two 2x40 LCDs to show the correlated GP button functions depending on the selected page. It will be possible to edit 4 tracks at once, or a single track in 64 step view! Matrix can either be used in addition to the 16 GP buttons/LEDs, or the upper row of the matrix replaces the GP functions. MBHP_AOUT, MBHP_AOUT_LC or MBHP_AOUT_NG to output velocity. Please note, that each track has only two velocity values defined (accented and not accented). It isn't possible to set individual velocities for each step. When you look on the Frontpanel again, you will notice a SHIFT and ALT button. They are used to select different button layers, labeled with red and green font. It would be possible to combine SHIFT+ALT to a new layer in future. Please note, that the frontpanel labeling is not intended "for production", but only to visualize the layers. The final frontpanel has to be discussed in the MB808 forum. By pressing the ALT button, the GP LEDs will display the currently selected menu page. The page can be changed by pressing the appr. GP button above the green labels. Edit Same as EDIT button - only available as additional way to select the edit page. Loop Allows to set the loop points of a step. The GP LEDs show the steps between these points. If you select a GP button right of the loop point, the end point will be changed. If you select a GP button left of the loop point, or if you press the SHIFT button, the loop point will be changed. Note that the track length can be set between 17 and 32 steps by setting the end point in section B. By doing so, section AB and CD will be combined to single section. A track length of more than 32 steps requires an end point at section C or E. By doing so, ABCD will be combined, and there are no separately selectable sections anymore. Hint: activate the "All function" (SHIFT+Edit button) to change the lengh of all tracks at once! In song/chain mode, the SPM (Steps per Measure) value defines, after how many steps the next pattern is selected. Manual If sequencer playing: position of all tracks will be set to the selected step. Rand(om) 16 GP buttons used for obscure random options. Note that it also works with multiple selected tracks. SHIFT button pressed: velocity of accented steps. MIDI SHIFT button not pressed: select a MIDI note with the 12 leftmost buttons, and the octave (1/2/3/4) with the 4 rightmost buttons. SysEx Allows to send a SysEx dump of current pattern or whole Bank for embedding into a DAW based project. The button number correlates to the device ID of the dump. The right side selects the actual pattern within the section, e.g. A1, A2, A3, ... A8. The sequencer will only change to a new pattern if you press one of the right side GP buttons (so that you can change to a new section or bank without disturbing the currently played sequence). SHIFT+Pattern: enters bank selection page: the GP buttons select one of 16 banks. A 64k BankStick can store 2 Banks (-> 128 patterns), which are called "Upper" and "Lower" bank, and print on the display with capital or lower case letter (A1: pattern in upper bank, a1: pattern in lower bank). A Bank change won't take place immediately - you have to enter a new pattern number in the PATTERN page so the bank will be changed. ALT+Pattern: store pattern page: The target location has to be entered the same way as descriped above: select the section (A/B/C/D/E/F/G/H) with the left GP buttons, and the target location (1/2/3/4/5/6/7/8) with the right GP buttons. The bank can be pre-selected with "SHIFT+Pattern" if desired, otherwise the current bank will be used. After the store operation, the sequencer will switch back to the pattern selection page to ensure, that you don't accidently overwrite multiple patterns. Song: restore pattern chain A1..H8. Up to 64 chains can be stored in a separate "Song" BankStick), same selection method as in pattern page. If no "Song" BankStick is connected, all LEDs will flash to inform you about this state (no Chain store/restore possible). The pattern selection page provides a chain function, which allows you to enter a chain of pattern changes. The chain will be automatically looped until a single pattern is entered without pressing the SHIFT button, or it will be processed only once (and not loop) if the "oneshot" option is enabled in ALT-Options menu. note that you can always add patterns to the chain by pressing&holding SHIFT again. A chain consist of up to 128 pattern changes. exit chain mode by selecting a pattern w/o pressing SHIFT button. The chain will be automatically cleared in oneshot mode, after the last pattern has been selected. Inst Encoder: allows you to select a single track quickly. The track will be displayed by the GP LEDs for a short moment. Press&Hold Edit button: alternatively, one or more tracks can be selected with the GP buttons so long the edit button is pressed. Multiselection: press more than one button to combine sections to a chain. E.g., if A+C+D are pressed, the pattern will be looped between A, C and D section, until you press a single button again. By pressing SHIFT+Section button, it is possible to edit a section, while the sequencer plays another one (e.g. edit B, while section A is played). Please note: if the track length is >16 steps, AB and CD section will be automatically combined. If track length is >32 steps, ABCD will be combined. Live: enables/disables live play mode, which allows you to trigger the drums manually with the GP buttons. Rew: Pattern mode: switch back 4 steps synchronously (nudge). Fwd: Pattern mode: switch forward 4 steps synchronously (nudge). Rotate <>: (SHIFT+Rew/Fwd) rotates (scrolls) the selected track(s) to left/right direction between the given loop points (!) and within the selected step view (if step 1-16 or 17-32 selected: rotate between A loop points, if step 33-48 or 49-64 selected: rotate between B loop points). This function is especially useful after a random pattern has been generated. Note that alternatively one or more tracks can be selected with the GP buttons while EDIT button is pressed&held - accordingly, this encoder is only an optional feature (I must admit, that I only find it useful to select all tracks with a single turn). Swing Pot: this pot (= absolute values) allows to change the "swing intensity" if one of the groove functions is activated. Exit and Menu button are mapped to ALT function. Select button is mapped to SHIFT function. The firmware has reached the release candidate state. All documented functions are implemented. The firmware (midibox_808) is available in the MIOS Download section. Before uploading the new firmware, please update to MIOS V1.9g first if this hasn't been done yet, otherwise the Tap Tempo function and the encoders won't work. MB808 users: please note, that the data structure is not compatible to Moogah's MBSEQ V2 based version! The BankStick will be reformatted after the new firmware has been uploaded!! So, please remove the BankStick (or create a backup. If somebody is interested, I could write a pattern converter for the new format.